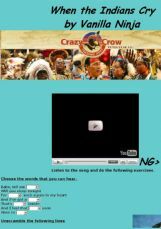 A song fill-in activity by the Black Eyed Peas. There is also a short vocabulary activity at the end. Choose the words that you hear in the song. For ss who have just started learning English. Gap-filling exercis. Words provided. Enjoy. A beautiful song by the Estonian band called Vanilla Ninja to develop listening skills. Easy to learn. Have fun. 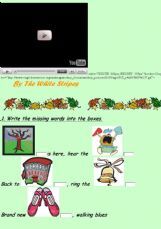 A nice song by The White Stripes-to start your first English lessons in the new school year-it�s about school and friendship.There are different listening comprehension tasks an finally a school schedule to practise school subjects.I hope you�ll like it. Students put the verbs into the correct past tense and then check their answers listening to the song. �The Show Must Go On� by Queen is one of my favourites and I think it is the real Queen of Rock History. 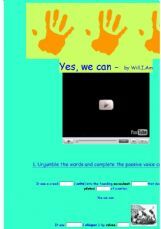 Probably even our students� great-grandchildren will know and sing it. So let them learn it now.